Stranger Things fondo de pantalla. 1440x900. HD Wallpaper and background images in the Stranger Things club tagged: photo stranger things netflix season 1 poster wallpaper widescreen 1440x900. 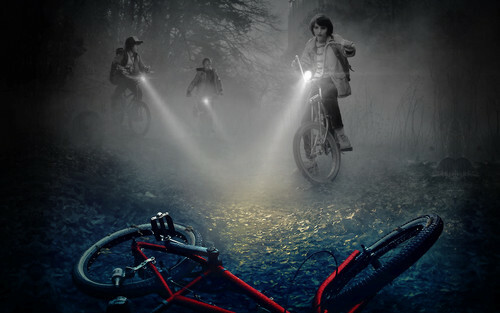 This Stranger Things wallpaper contains ciclismo, montar en bicicleta, andar en bicicleta, bicicleta de montaña, bicicleta todo terreno, del roader, off roader, and bicicleta de todo terreno. There might also be bicicleta, bici, rueda, ciclo, ciclo de, and fuente.